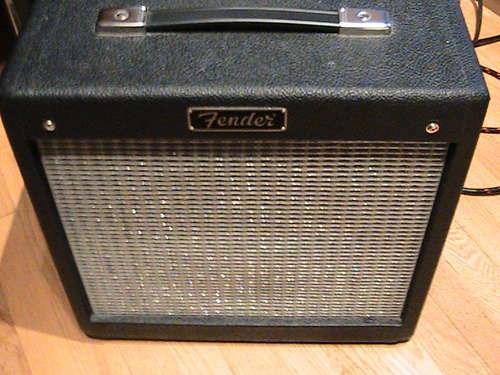 While cutting a guitar track recently, I discovered that my damn Fender Pro Junior tubes were going microphonic again. I love the sound of that amp, since it does some nice power tube overload in a more controlled setting for recording, but it just eats tubes! Maybe the tech who re-tubed it last just didn’t bias it correctly. I don’t know. For whatever the reason, I get a sound and gain structure and then I start hearing that tell-tale resonance. The tubes were making that dreadful noise again. What could I do? I couldn’t call up my assistant and get him on the case. He was on vacation. :~) I didn’t have another amp like that one at my disposal either. With a heavy heart, I considered using an amp simulator. An amp simulator is a device or piece of software through which one can play an electric instrument, like a guitar or bass, and connect directly to a sound system or recording console. The simulator makes the instrument sound as if it’s plugged into a miked amplifier. For the non-technical, it should be noted that in most recording situations, an electric guitar is almost never plugged directly into the console. The sound coming off most electric guitar pickups is pretty lousy. The transients will knock your head off and the tone just dies in your arms. Amplifiers round off those transients and add the color that we have all come to know as the sound of an electric guitar on record. There are notable exceptions, but the direct sound is very distinctive. You can hear it on most any Motown record. The guitar on “Black Dog” by Led Zeppelin, though layered, is also direct. Compare those guitars to the miked amplifier sounds on “Back Stabbers” by the O’Jays or “Misty Mountain Hop” on side two of the same Zeppelin album. For reasons of physics that I won’t get into, an amp simulator comes pretty close to the real thing. The feel for the player can be different, but the sound of the various simulators available seems to be getting better all the time. So why, you may wonder, wouldn’t I use them regularly? I could plug my guitars directly into my recording console and get any sound I wanted, at any level I chose, with almost no effort. I wouldn’t disturb the neighbors. I wouldn’t have to set up mics. I’d never need to lift a heavy amplifier again. Anyone listening to my records would never know the difference. The reason is that a great sound with minimal effort presents a moral dilemma for me. Recording music is an art, as much as the creation of the music itself. You’re not just slapping a microphone in front of a sound source and pressing Record. Nuances like the mic you choose, where exactly you place it in relation to the source and the room in which you do all of this make all the difference in the rendering of your sonic statement. It takes know-how, experience and discipline to do it right. I don’t auto-tune my vocal tracks. I don’t quantize my sequences. I never work with looped phrases. Twenty years ago, an engineer plugged me into his new rack-mount Tech21 Sansamp unit for an overdub. His rack was right next to a perfectly good Marshall half stack and I just exploded! I only use amps! Don’t you respect that? (I’ve mellowed since then.) Now, faced with equipment failure, I was at the same creative crossroads. How could I call myself a producer if I just dialed up whatever guitar sound I wanted and wasn’t directly (no pun intended) responsible for its every detail? I DO care about art. I’m an ARTIST, damn it! Oh the humanity. Well, much like the letting go that allowed me to use synthesizers, which was the realization that with them more of my music gets made than without, which is the whole point, I went with the simulator and finished a great-sounding track. It turns out that the amp simulator I used provided an unimaginable level of control. You could choose the mic you wanted to simulate, where you would place it in front of the virtual guitar amp, the size of the room in which you recorded your amp and where you wanted to place the microphones in that room to capture the acoustic environment. Hell, the virtual amp even hummed! There were plenty of creative decisions with which to ease my guilty conscience. The only decision I didn’t have to make was whether to proceed with microphonic power tubes. Maybe they’ll add that to the next version!